Forty-one senators (out of 348) French have signed a manifesto on Catalonia using the indepe terminology. They denounce the "repression" of the "political representatives imprisoned or forced into exile" and ask "that France and the EU countries intervene". The text has been released by one of the promoters, André Gattolin , who posted it on his blog on the website mediapart.fr . Gattolin is senator of the Upper Seine and member of the group that supports the president, Emmanuel Macron, the Republic in March. He holds the position of vice president of the European Affairs commission. The French Upper House is rarely news in France. Subordinated to the legislative power of the Assembly, its very existence is questioned in the face of the constitutional reform being prepared by the President of the Republic, Emmanuel Macron. The signatories feel "affected by the serious events" that have happened in Catalonia. They make public their manifesto about the trial in the Supreme to the promoters of 1-O. The first of the five points calls for "respect for freedoms and fundamental rights in Catalonia." 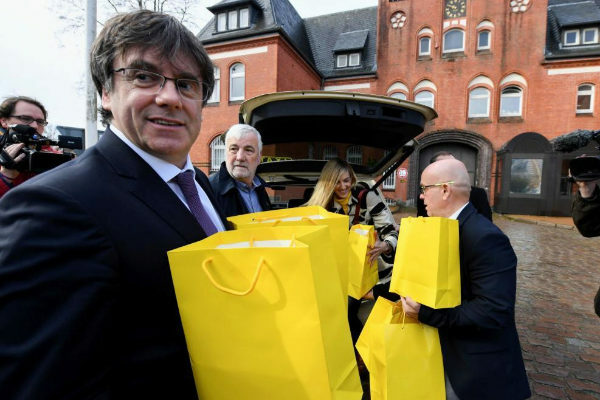 In the only nuance of their text, they say they do not want to "get involved in the political problems of a neighboring country" or "take sides over the independence of Catalonia." The lexicon of the following points contradicts that statement. It is univocally the one used by the supporters of the independence of Catalonia. Thus they denounce "the repression of those who are legitimate elected victims, representatives of the Generalitat (...) imprisoned or forced into exile for their opinions in the exercise of the mandates entrusted to them by the electors." Cosntatan "a real violation of democratic rights and freedoms", regret that "the seriousness of this situation is underestimated" in France. Finally, they ask "France and the countries of the EU to intervene to restore the conditions of dialogue in order to find political solutions to a political problem." The Spanish ambassador to France, Fernando Cardedera, said: "I regret and reject this manifesto that demonstrates the absolute ignorance of the situation in Spain by a very minority group of French senators." As EL MUNDO has learned, the Spanish legation was in contact with the leaders of the political groups of the Senate to clarify this situation. To date, the institutions of the French Republic had aligned seamlessly with the thesis of the Spanish Executive before the independence challenge. Among the 41 signatories are all the senators of the communist group (16), 13 (out of 74) socialists, 4 (out of 145) of the Republic in March, 2 (out of 51) centrists and 2 (out of 22) of the Social Grouping and Democratic.